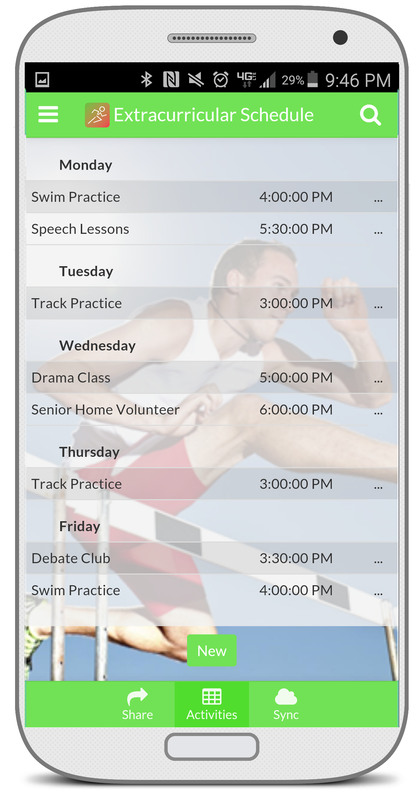 Extracurricular Schedule is an app to keep track of all the extracurricular activities a student might participate in. The app organizes activities by day, so it’s easy to see which activity is happening when. It allows the user to add new activities as well as an image to accompany it. When clicking into an activity, there are also notes associated with each that let the user know instructions for an activity that’s happening on a specific day. Manage your after-school activities. The activities view groups the activities by day so it's easy to quickly see what is happening when. Add new activities. If you take on a new activity and want to add it to the schedule, just click "New". You'll be able to name the activity, choose the day, the time, and add an image. View notes associated with activities on specific dates. When you click into any activity, you'll see a "View" button with a number next to it. That number refers to how many notes there are for that activity. Clicking "View" allows you to see helpful notes instructing the user about special circumstances for that day's activity. Add notes to activities. If you click into an activity, you'll see next to "Notes" a "View" and a "New" button. 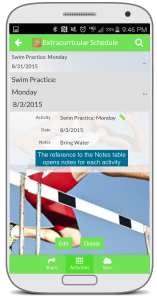 Clicking "New" allows you to add a new note, with the ability to choose which activity and which day, specify the exact date for the note, and then add your comments. Ref-- This app is utilizing two worksheets from the same workbook: an Activity table and a Notes table. The Activity table is the main view in the app. We’ve created a reference from the Activity column in the Notes table to the Activity column in the Activity table-- when the user clicks into an activity and wants to add notes to it, she simply needs to click “New” and the activity with the day is pre-populated from a dropdown menu.